The Hispanic Association of Colleges and Universities (HACU) is partnering with KIA Motors America, Inc. to award 10 scholarships to eligible students attending a HACU-member institution. A total of $34,000 in scholarships will be awarded to eligible students. Online applications will be accepted until May 25, 2018. 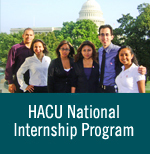 The KIA Motors America, Inc. scholarships are part of the 2018-19 HACU Scholarship Program. Click here to apply.